I am so glad Windies won the cricket. Five years without winning a test series. Nine years since we’d lifted that trophy. Like I said, I am so glad the Windies won the cricket against England today. 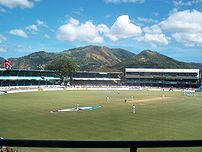 And as a Trini, I am jealous of everyone who was living it up at the Queen’s Park Oval over the last five days. Congratulations, fellas. I hope we can keep up the good showing.